Farmland is extremely valuable in Monterey County. Even while growers minimize pesticide runoff and fertilizer applications, downstream water quality is sometimes impaired. Vegetated treatment systems, including vegetated ditches and constructed wetlands, are demonstrated to substantially reduce certain constituents such as nitrate and some pesticides. They do this without occupying much more space than traditional field drainage ditches. A Vegetated Treatment System is a planted area that water is directed through to improve water quality. These systems take advantage of the process of phytoremediation, which means the removal of contaminants from water or soil by plants. 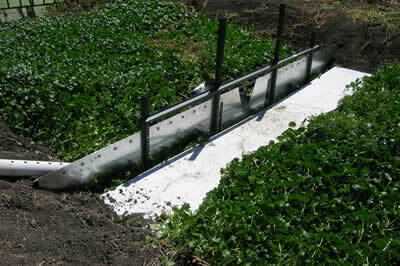 For example, pesticides often adhere to plant surfaces, where degradation can occur. Microbes living on thin films on plant roots will take up nutrients such as nitrate. Constructed wetlands are Vegetated Treatment Systems where the area is flooded or the soil is saturated for extended periods of time. These systems are particularly well suited for removing nitrate and certain pesticides. Vegetated Treatment Systems must be designed carefully to accomplish water quality goals, and to prevent flooding, elevated water tables, mosquito and crop pest problems. Contact us if you have any questions.